TL;DR: Helge is an awesome developer, a respected software development manager and a successful entrepreneur (you can tell he has a healthy self-esteem as well). 20+ years of experience. Some (including himself) claim that he is almost always sometimes right. Available for projects that match (Swift()/[Objective C] w/ a slight focus on server side stuff). Today: I'm running a company - ZeeZide GmbH - which works on products not yet disclosed, and I'm doing freelance projects in the calendaring space as well as iOS/macOS projects. Want to checkout some fun stuff? Go here: CodeCows, ASCII Cows. FOSS projects I'm working on: swift-nio-redis, SwiftXcode, ApacheExpress, ZeeQL, Noze.io, mod_swift, and a few more. If you got some interesting project that might match, feel free to contact me. Some History: Born in the former GDR on Sep 21st 1976 (birthday presents welcome). Started to play with GDR computer equipment as a teen (doing Assembler, Forth and Basic). Wall came down, got access to better hardware. 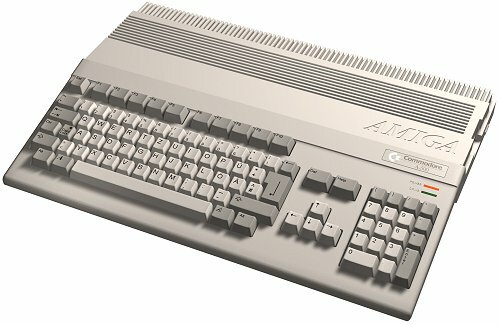 First an Amiga 500, then an Amiga 3000UX. Learned programming on those machines: 68k Assembler, C, Modula-2, Oberon, Cluster. Started to look into Objective-C. YES, I really did Objective-C on an Amiga, you can bet it was crap. Played with dial-up mailboxes/BBS on 14kbit modems. Went to a local ISP in ~1994 to talk them into connecting my school to the Internet. Found ~10 NeXTstations, a Cube and a guy playing with an Apple Newton. Obviously started to work there, got a NeXTstation. Stayed there doing various early-Internet things. Web-shops, CMS systems, etc. Wrote a billing system in WebObjects 2.0. Finished school, had to do 10 months military service (German Air Force). Started studying computer science, still working at MDlink. Won a German startup competition and used the money to become an MDlink partner. Did various iterations on the software called "SKYRIX web groupware" (initially developed as an Intranet solution for a multinational). Forked off the Skyrix part into an own venture, SKYRIX Software AG. Worked on developing Skyrix products and projects, managed a small and (initially ;-) motivated development team as the Skyrix CTO. Kicked off and implemented the first major OpenSource groupware project - OpenGroupware.org - in 2003. Did various now-OGo projects. Developed a massively scalable variant (ScalableOGo). Sold my MDlink stock. Switched from the Skyrix management to the advisory board in 2006. Became a freelance consultant/developer in 2006 and worked on a few interesting projects. Together with Nat! I founded ZideOne on Dec 1st 2008 to develop a MAPI message store provider implementing the CalDAV, CardDAV and GroupDAV protocols. Some people on the interwebs claim that it got acquired by some big company, but I can't confirm that. In 2014 I took a year off and focused on researching technologies for home automation as well as getting fluent again in Cocoa, iOS and various web technologies (yeah, I even toyed with ExtJS and Node.JS). When Swift got released I jumped on that to figure out whether it is of any use ;->. As of 2016 it is still not there. Started resurrecting GETobjects a little bit, though I currently don't have any real use for it. Family: Not for adoption. Married with two awesome daughters: a horse-loving 14y old and a funny 7.9y old. Parents: Dr. Magrit Heß and Dr. Günter Heß, both on pension.